“This place is amazing! The people are so sweet and the benefits of the therapy are sensational! “Salt Retreat is a premier salt therapy center, above and beyond anyones expectation. The decor is relaxing, well thought out. They spared no expense building the facility. Clean, relaxing, thoughtful products, exemplary customer service. I highly recommend salt therapy for all your allergy and respiratory ailments and especially Salt Retreat. 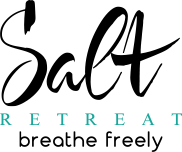 “The Salt Retreat is a little slice of holistic heaven in West Frisco! As a lifelong allergy sufferer with occasional asthma flare-ups, I am so glad I found this place! I’ve been four times so far and experienced relief after each session. I have felt noticeably better and breathe a little bit easier after each session. I also find that I am sleeping better at night. Dry salt therapy is not an instant cure-all, of course, but I do think it is a wonderful, holistic complement to other treatment I get through my regular doctor (allergy shots, medication, etc.) My goal is to phase off of some of the traditional drugs in the long run. The group room is very relaxing, with heated, zero-gravity armchairs, soft music and dimmed lights. I almost always fall asleep for the whole session, because it’s so relaxing! “Loved the owners, cleanliness and it’s so relaxing my 13 year old napped- which never happens..ever. “What an amazing place! Greeted by James – he explained how the salt treatment worked, the benefits & what all room types they had. He discussed the products they sell and all the benefits to those. Such a wonderful experience, he was very nice and knowledgeable. I was in the group room, very spacious & cozy too. The zero gravity, leather heated chairs were AMAZING! Brought my book to read and James gave me a reading light. Your items are stored in a locked locker. The dim room and soft music was very relaxing. After, I meet his wife Heather, who was again so nice and very knowledgeable of the products. She offered me hot tea. I ended up buying some of the Mindful Minerals & a salt lamp. “Lovely, relaxing place with the sweetest owners! I will be back! Can’t wait to learn more about all the health benefits, but I know this place has already helped so many friends with allergies and skin conditions. Do yourself a favor and go to this gorgeous, clean and peaceful spa-like place which has amazing health benefits! The owners are so gracious and kind and have GREAT pricing on everything! “I took my daughter first time last week. She had a little cold/running nose. Night after session she slept like a baby. “Beautiful, clean, and extremely relaxing. It is hard for me to unplug and feel that relaxed. I sure felt it there, though. “As an athlete I was curious about this treatment pre work out. I have been lifting long enough to notice a difference in breathing. Today after my treatment during a taxing routine. I noticed my breathing was a ton better. Most of all drastically different in my later top steps that I’m normally fatigued in. Looking forward to trying this some more. things to say about the service and the owners. Ever since relocating from SoCal to TX many years ago I developed allergies to pretty much every airborne, environmental allergen under the sun. I was taking allergy medicine daily, oral steroids (as needed) and getting three allergy shots on a weekly basis for five years with minimal relief. My allergies got so bad that I had sinus infections at least twice a year. I underwent surgery which alleviated the sinus infections but obviously not the allergies. salt therapy has changed my life (for the better). Heather and James are the owners of the business and they always greet me by name when I walk in the door. They’re friendly, inviting, easy to talk to and very accommodating when it comes to last minute schedule changes 🙂 I visit three times/week so when life happens and I need to cancel or reschedule they’ve always been understanding and helpful. They’re one additional reason I look forward to my 40 minute retreat. So…if you’ve been on the fence or are skeptical as I was – hopefully this review will nudge you to give it a try. “After just a few visits we have seen a noticeable difference in my husband and son’s allergies. My kids love the kid’s play room and look forward to going. The owners are some of the nicest people we’ve met and are very helpful. “The Salt Retreat is amazing! I had never heard of salt therapy and all of the wonderful health benefits that it provides. After learning that it’s an all natural treatment that helps with allergies, snoring, asthma, skin conditions sports recovery and so much more using dry Himalayan salt I had to give it a try. I suffer from terrible allergies and take allergy medicine daily. I was tired of taking the medicine so I was open to a natural treatment. After only 1-40 minute session of salt therapy and relaxation while sitting in a zero gravity recliner, I definitely could breathe better. That night I had a restful night’s sleep. With experiencing the benefits after only one session, I had to get a membership. I try to go a minimum of 3 times per week. I can feel and a drastic improvement in my allergies breathing and skin. My dark circles under my eyes that are a result of nasal allergies are slowly disappearing. For the avid sports and fitness enthusiast, It’s great therapy for sore muscles. In addition to all of the extraordinary health benefits, it’s a great opportunity to unplug by turning off the electronics, relax and escape from everyday life for 40 minutes. “Great staff that is knowledgeable and helpful. Very clean and tidy location. Has been helpful for me.